Have you ever been completely, abjectly wrong? A time when you were so confident of what you believed that you simply turned away from any other point of view or experience. And, then you are challenged, nay you challenge, to a duel and you are embarrassingly shown up in your silly stubbornness. So shocked are you that you simply give in and accept not just your mistake but the reality that trumped your former prejudices? Yeah, that has happened to me a lot. I am one of strong opinions and convictions. So, I can spot that in others so easily. It is a very interesting experience to be on the other side of that person, I take particular joy when it happens to others in matters of food and culture. So many cuisines around the world are chalked up and brushed off as bland, unexciting, odd, boring etc. And, often that is because the person has simply never tasted the real stuff. Idaho has nothing on NY! Maybe it is because of how wet upstate NY is throughout the year..? Like Ireland! I, for example, don't like Chinese cuisine. To me it is bland, gelatinous or greasy and totally unwarranting of hype. But then, I have never really had a proper Chinese meal, ever, since I have not yet been to China! You are probably laughing at me by now and wondering if I am insane. In New York, where every cuisine makes its mark, how could I say that? The reality is that no matter how authentic any ethnic restaurant wants to be, to be viable in a foreign market, there needs to be some adaptation to the palate of the market. Even more, since the quality of ingredients are vastly different, it is an unfair goal. For example, what one finds bland here could simply be the inferiority of the meat/fish/produce used rather than the cuisine itself. British/Irish/Scottish cuisines suffer from that generalization of blandness. Meat and potatoes is the abject disdain with which the entire landmass food is painted. Ironically, the history of Britain's cuisine is quite indulgent, rich borrowing influence from her neighbors as well as her conquests. Albeit, this was the luxury of the rich, who in Tudor times to Victorian through the Elizabethan dined on sumptuous courses decadently sauced and served with a temperamental French flair. But, it is the commoner's meal that become more associated with the cuisine, unsurprisingly given that they emigrated the most and their food is the easiest to source. Nevertheless, the issue is not about the societal strata but the perception that it is bland without the garnishes of flavorings and flamboyance of seasoning. The reality is the stuff tastes so good to begin with, over there, that you need little more than salt and pepper to bring out the best in it! In the UK, despite the industrialization of agriculture, the average meat or produce tastes so much better than in the US. Hop over to Ireland where many farms and fisheries are still family operated and backyard husbandry abounds, it is simply an insult to the ingredient to douse it in seasoning or sauce. The meat or vegetable shines in its own glory! All you need are salt and a fat pat of Irish butter and its divine. The first time I visited Ireland, I was warned about how much everything is cooked to obliteration in a home kitchen. It is beyond well-done. It is simply over done in many cases. I was prepared and I kept my expectations at bay. But, I was completely unprepared for how amazing it tasted despite the overzealousness of the technique. Oh and the potato... Ah the potato! The Irish are sensitive about their potatoes. Rightly so. History had the blight and the plague. But, that is in the past. They have a right to so today because their potatoes taste bloody awesome!! All you need are salt and a fat pat of Irish butter and its divine. For a long time, I was picky about my potatoes from the supermarkets. They are bland. Then, I discovered farmers' markets and the produce of upstate New York. I don't think the region classifies as fine agrarian terroir but it is seriously awesome for growing root vegetables. Maybe there is something to do with how much more wet it typically is throughout the year..? Since that fine discovery, the potato has been a regular staple in my pantry. 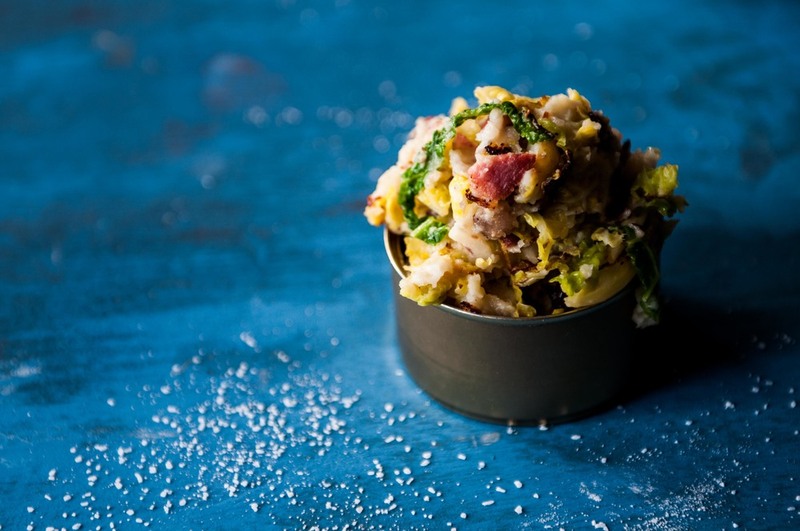 In light of all of this waxing I have been doing about international cuisine, I am sharing an Irish potato dish from county Kerry in South West Ireland - Colcannon. To me, it brings the best of everything I love of Irish food - said potatoes, quality meat, savoy cabbage (THE BEST I have ever had), and, Irish dairy! Bring them together and it's heaven! This dish is typically served as a side with boiled ham (yes, boiled! Don't shirk it till you taste it...) or some other pork dish. I served it with fish. Broiled salmon. It was AWESOME! It is that kind of versatile! This post is a FSK partnership with the US Potato Board and Honest Cooking. Thank you for supporting FSK clients.